It looks like April is the month for the big names in the Android world to be rolling out their latest updates. Samsung is getting ready to release the updates to the Galaxy S. The HTC Desire family is looking to be getting some Gingerbread goodness before the month is out too. Samsung have decided to act on what was promised and have started pushing their mid-April 2.3.3 update for the Galaxy S. Of course there have been custom ROMs based on the Nexus S floating around the internets for some time but now you can get your hands on the real deal. 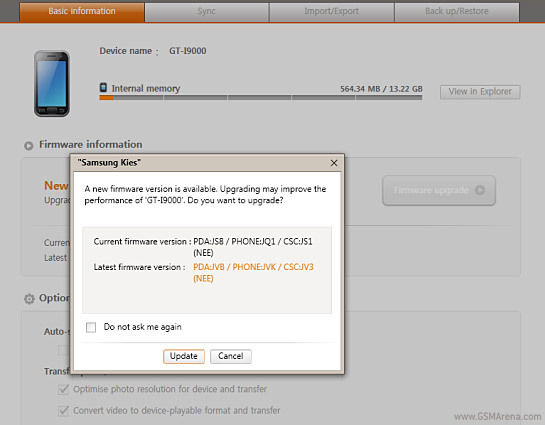 Samsung have fired up their Kies servers and the update has already cropped up in the Nordic countries, Holland and Germany, with the rest of Europe looking to get it in the days to come. With more than 10 million Galaxy S's out in the wild, this looks to be a welcome update that will add a little more longevity to an already solid smartphone, especially with its newer, more powerful younger dual core brother about to hit the shelves.